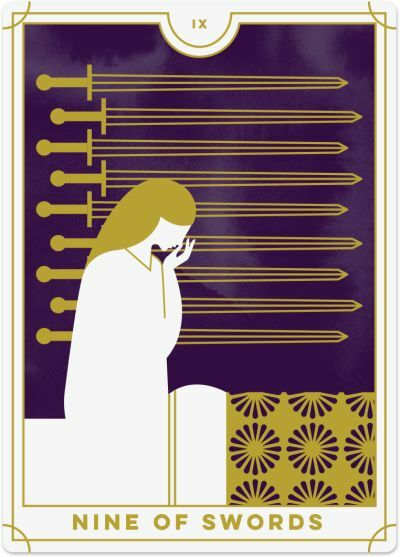 The Nine of Swords shows a woman sitting up in her bed with her head in her hands. She appears to have been jolted awake from a terrible nightmare that has left her disturbed, scared and anxious. Nine swords hang on the dark wall behind her, representing the negative thoughts that weigh heavily on her mind. The base of the woman’s bed features a carving of one person defeating another, and roses and the outlines of astrological symbols adorn the quilt wrapped around her. The Nine of Swords suggests that dark thoughts and disturbing feelings are weighing you down (and keeping you up at night). You are worrying excessively about a situation, and your negative thoughts are getting the better of you, leaving you stressed and anxious. The more you associate with your fears, the more they will rule your life. As you obsess over what’s not working, the more anxious you become and the more you will worry. It becomes a negative cycle where one awful thought leads to another, and another, and another until they overwhelm you. Just as the nine swords are stacked upon each other on the wall, so too are your negative thoughts. Be careful because the fear and worry in the Nine of Swords can become a self-fulfilling prophecy. As you obsess over what may go wrong, you are more likely to manifest your worst-case scenario because you are inadvertently acting in ways that support your negative thoughts. For example, you may worry that your partner will cheat on you, even though you’ve found no signs of infidelity. The more you stress about this potential outcome, the more your anxiety pushes away your partner, until one day, he feels so disconnected from you that he starts a new relationship with someone else. When you are repeating negative thoughts in your mind, you run the risk of manifesting them in your life. So, the Nine of Swords asks you to break the cycle. Every time a negative emotion comes up, replace it with a positive one instead. The Nine of Swords reminds you that much of the fear and worry you are experiencing is in your head and not necessarily an accurate reflection of what is happening around you. You may make things worse for yourself by over-thinking or obsessing over the worst-case scenarios. It is time to examine your situation from a new perspective. Instead of looking for evidence of what is going wrong, put your attention on what is going right. Take a deep breath and realise that life is not as dreadful as it seems and that the more you worry, the more harm you are doing to yourself. The Nine of Swords often crops up when worry, despair, and anxiety are quite literally keeping you up at night. You may not be sleeping well, or you are experiencing frequent nightmares. Your constant thoughts are preventing you from resting. When the Nine of Swords appears in a reading, it is time to reach out for help. You don’t need to do this alone – enlist the support of others to help you get through this dark period of your life. Others will help you to see the light at the end of the tunnel and lead you towards a solution or a sense of peace despite your troubles. You are struggling to look at your situation clearly, as you are plagued by negative thoughts, so having an objective, third-party perspective will help you find your way out. The Nine of Swords reversed shows that you are experiencing deep inner turmoil as a result of your mindset. Your negative thoughts are taking you in a downward spiral of despair and anxiety that contradicts reality; you are making things feel much worse than they really are. You may try to keep your worries private and personal to you, but if you are struggling to keep your head above water, it may now be time to confide in others and seek their help and support. Others will offer you a new perspective, or even just a place to vent, that will ease some of the stress and tension. The Nine of Swords reversed appears when you are gripped by fear. You are allowing your fears to impede your fullest potential and it is stripping you of your life force. You cannot take a step forward because you are so distressed about what might happen. Get a reality check and evaluate which fears are warranted, and which are not. Release your limiting beliefs, crippling fears, and self-doubt. 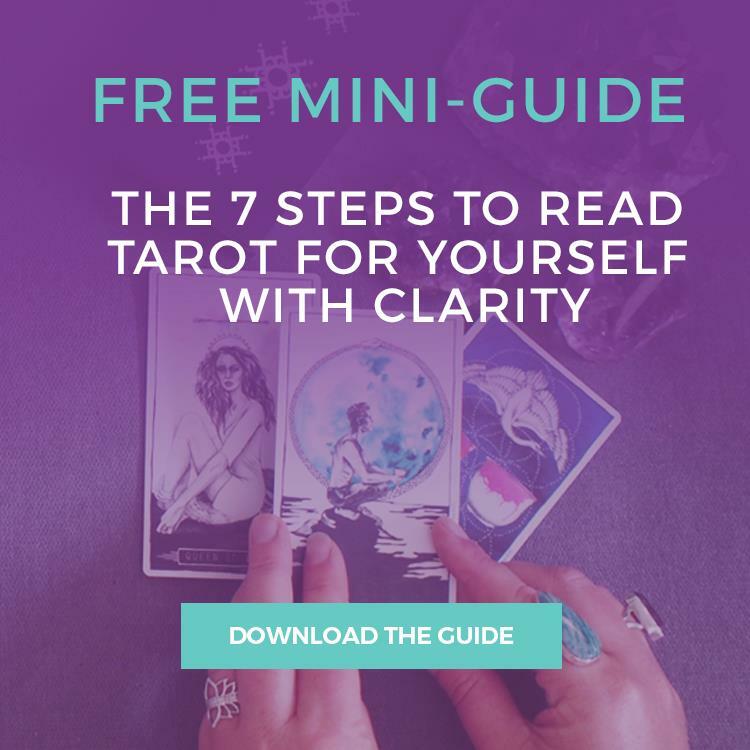 The reversed Nine of Swords can also point out that you are incredibly hard on yourself, putting yourself down or engaging in negative self-talk. So, when the Nine of Swords reversed appears in a reading, ask yourself why you are so hard on yourself. How are you putting yourself down, and what is the source of your depression? What can you do to make yourself feel better? You may need to make a more conscious effort to quit the negative self-talk and replace it with positive reinforcement for a job well done. On a more positive note, the Nine of Swords reversed can show that you have already worked through this period of worry and depression and are making a recovery. You may have come to the realisation that things are not as bad as you made them out to be, and you are beginning to relax and calm yourself about what was once a terrifying situation.